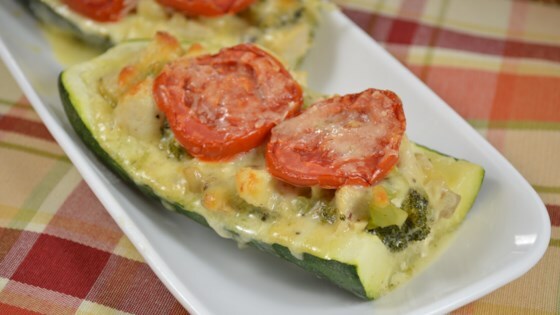 "Chicken, mushrooms, onion, broccoli and Classico® Creamy Alfredo sauce add the perfect punch to these zucchini boats!" Preheat oven to 350 degrees F (175 degrees C). Spray a rimmed baking sheet with cooking spray. Slice zucchini in half lengthwise and remove inner flesh with a small scoop or spoon leaving a 1/2-inch thick shell. Chop the zucchini flesh and reserve. Lightly oil a non-stick skillet and set over medium heat. Add chicken; cook and stir until beginning to brown, about 5 minutes. Remove chicken from pan. Melt butter in skillet. Add onions, mushrooms, and broccoli. Cook and stir until onions are soft and broccoli is crisp tender, about 8 minutes. Add reserved zucchini flesh and chicken; continue to cook about 5 more minutes. Stir in the Alfredo sauce and bring to a low simmer; simmer 5 minutes. Season with pepper. Fill zucchini boats with Alfredo mixture; place on prepared baking sheet. Top with 1 tablespoon shredded mozzarella cheese, tomato slice, and Parmesan cheese. Bake until zucchini are tender and cheese has melted, about 20 minutes. Let cool 5 minutes before serving. We loved this. I did barbecue the zucchini on the grill brushed with olive oil. Filled the zucchini with mixture placed the boats tight together on the baking sheet. Baked as recommended. My husband thought it would be "good" but proclaimed it "delicious!" Will definitely make again. Thanks for sharing the recipe. I did use a Lite sauce and did have to bake slightly longer.